A PRP stem cell facial uses stem cell science to encourage the body to produce more collagen to eliminate lines and wrinkles. Performed by Dr. Brar, this safe procedure uses a small amount of your blood, which is then processed in a centrifuge to separate the platelets using TruPRP. The platelet-rich plasma, or PRP, is then drawn into a syringe and applied to any areas of concern. The entire procedure takes about one hour to complete. Results begin appearing within a couple of weeks of treatment and continue to improve over several months. Platelet-rich plasma is widely used in regenerative medical treatments for its’ rich growth factors and proteins that are necessary for healing. In cosmetic treatments, PRP stimulates the proliferation of keratinocytes and fibroblasts, which are responsible for producing keratin and collagen. To learn more about the benefits of a PRP stem cell facial, schedule a consultation with skin care expert, Dr. Brar today. The cause of hair loss varies in men and women leading many in search of a permanent and natural solution. PRP for hair loss has received much media attention recently due to its healing benefits. Platelet-rich plasma, or PRP, is concentrated blood plasma that has approximately five times the normal amount of platelets found in blood. Comprised of growth factors, PRP promotes the regeneration of cells within the body. Healthy hair is dependent on a healthy blood supply. When PRP is introduced to damaged hair follicles, natural healing occurs. Performed by Dr. Brar, this safe procedure uses a small vial of your blood. The blood is then placed in a centrifuge to separate out the platelets. The platelet-rich plasma is then put in a syringe and applied to the scalp via injection. Topical anesthesia is used to minimize discomfort. The procedure takes approximately two hours to complete. Mild pain or discomfort may be experienced at the sites where PRP was injected. Multiple treatments are typically required to see results. 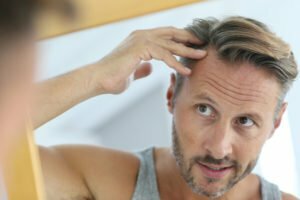 To learn more about the benefits of a PRP for hair loss, schedule a consultation with Dr. Brar today. At Amani MedSpa, we’re proud to provide hair loss and skin care services to patients from Valrico, FL, and the surrounding cities, including Tampa, Brandon, FishHawk, Lithia, and Riverview.